Yoshimaru, is a boy who is troubled in love. 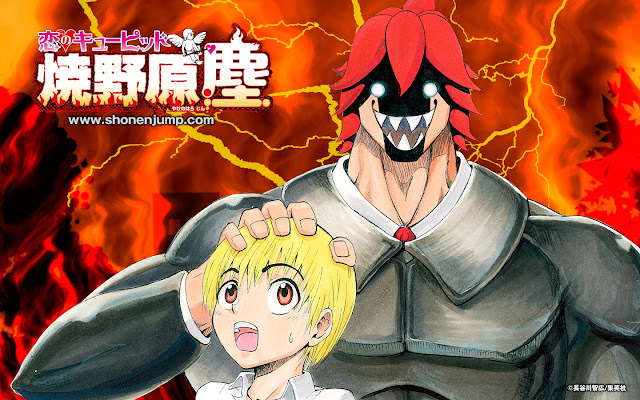 What came down before him was the ex-demon king, Cupid Yakenohara Jin… The first and last LOVE game of destruction and chaos, love and comedy begins!! Koi no Cupid Yakenohara Jin which translates as Cupid of Love Jin Yakenohara started in issue 43 of Weekly Shonen Jump by Tomohiro Hasegawa. With its gag elements Koi no Cupid received an honorable mention in the 2012 Golden Future Cup, but will it survive serialisation in Weekly Shonen Jump? Only time will tell.